You’ve decided that an MBA is the right path for you. A diligent person, you make a list of your favorite MBA programs and note the median GMAT scores so you can set a proper goal. Because you’ve got your sights set on the top ten with a soft spot for the top three a 700+ score seems imperative. Fair enough. You’ve done well on standardized tests and aren’t afraid of a good challenge. Three months later after grueling through a couple hundred hours of studying you are sitting in front of a rather schlubby looking computer taking your official GMAT. It’s challenging, especially on the Quant side. You were a bit rushed there. Verbal was a slog but there were no surprises. A few clicks after the last verbal question and: 720! 94th percentile! You made it!!! Or did you? You notice that you nearly failed the Quant with a percentile score in the low 60’s. What?!! How is that possible? Damn you GMAT Quant percentiles! Is Harvard slipping away? The short answer is: no, Harvard is not slipping away. Everything is OK. Read on for a detailed analysis of GMAT percentiles and an 80th percentile Quant score isn’t necessary for admission to a top MBA program. When does an imbalance in GMAT percentiles warrant a retake? 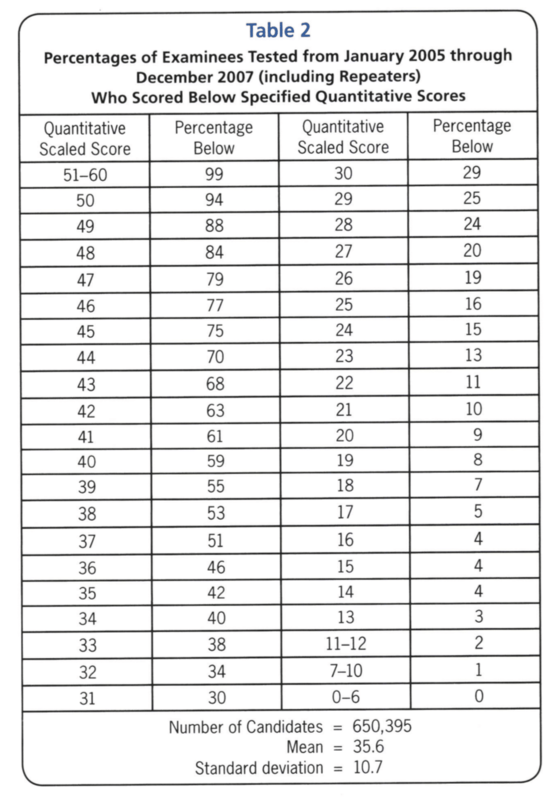 Back in 2000, a GMAT scaled score of 45 represented the 82nd percentile (see table). 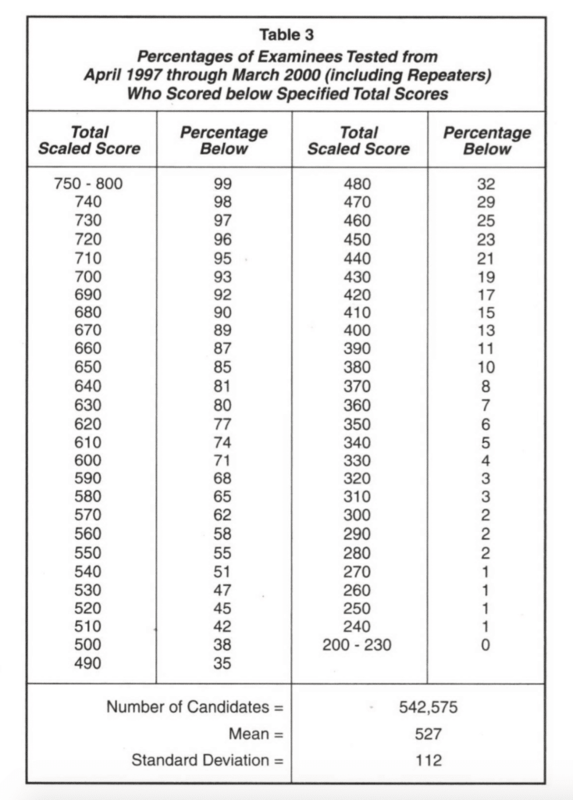 GMAT Score Percentiles from 2000. Notice that 45q is the 80th percentile! That seems to be when the quant 80th percentile really mattered. Since then, as illustrated in the accompanying tables, what was the 80th percentile has dipped to the 78th, 75th, 71st, and now D grade 63rd percentile. Astonishing! So, yes, the GMAT quant 80th percentile does matter. But not the 2019 80th percentile, the 2000 one:). Why have GMAT score percentiles changed? The simple answer is that more people are getting perfect or near perfect scores. In fact, the way that the GMAT percentiles are now, there is no 99th percentile quant percentile. You can only get to the 97th percentile. A full three percent of GMAT test takers are ringing up a perfect quant score. Why are people doing better? I’d like to think that Atlantic GMAT is the sole reason but the facts point elsewhere. It has to do with the shifting demographics of GMAT test takers. People from countries that tend to provide a better math education than is provided in the US have been taking the GMAT in much greater numbers. These folks are making the GMAT percentiles (on the Quant side) much more competitive. Here is a more in depth discussion on changing GMAT Quant percentiles and how Americans are lagging. One interesting little tidbit from the article, "according to GMAC, Asia students spend an average of 151 hours in test preparation; U.S. students average 64 hours." 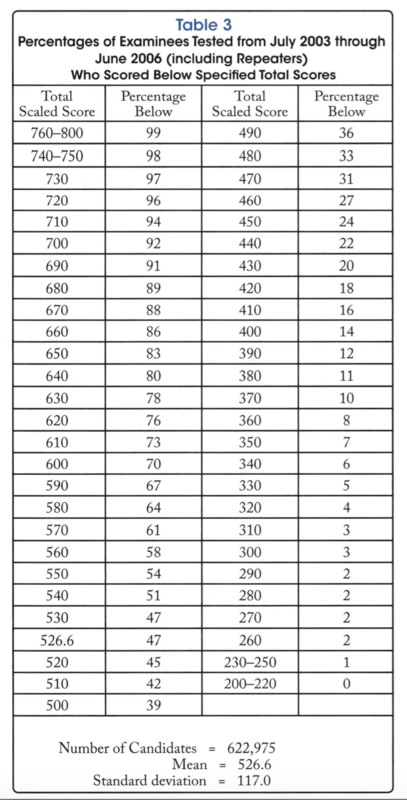 GMAT Percentiles 2003. 45q lost 80th percentile status! and then to the 75th! 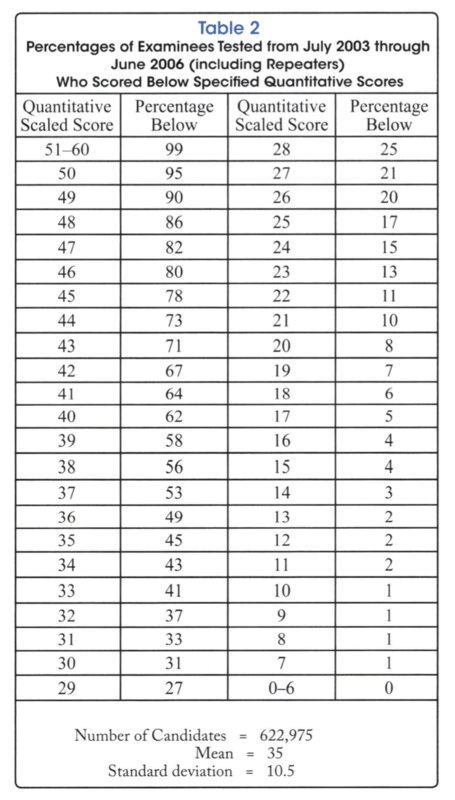 GMAT Percentiles Quant 2005. A 45q dropped to the 75th percentile! 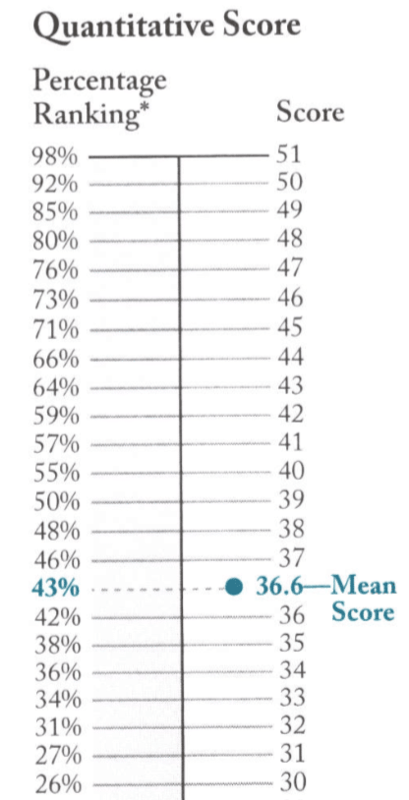 GMAT Percentiles from 2009. The rats are leaving the ship! and then, finally, the sad looking 63rd percentile where it sits in 2016. 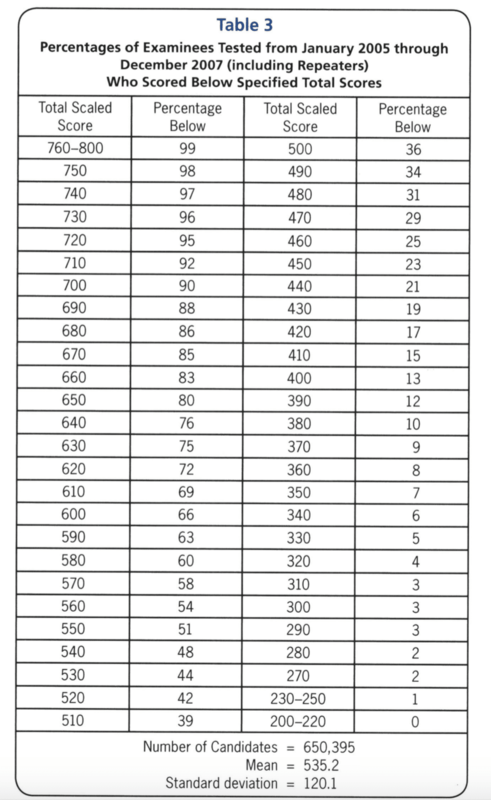 GMAT Percentiles 2016. A once desired 45q has sunk to the 63rd percentile. Part of why achieving a 2019 80th percentile GMAT Quant score doesn’t matter is that a GMAT score percentile only measures relative ability. It is the scaled score that measures absolute ability. So a Quant 45 from 2019 is the same as a Quant 45 from 1997. That’s why the sub-section scaled score is more meaningful than the percentile score. It is a measure of your skills. And, people who have been doing admissions for years recognize that. The percentiles may change, but the scaled scores still represent a known quantity in terms of ability. Here's an article straight from the 'horses mouth' (GMAC) discussing GMAT scaled scores and GMAT scoring. With a Quant 45 you have the skills to face the rigor of an MBA even if your percentile seems pathetic. Do you need to have a near perfect quant score to do well in an MBA program? Nope. Think about it like this: let’s say there’s a certain amount of weight that you have to be able to lift in order to become a fireman in New York City. Let’s say that’s 200 pounds. Does it make you a more qualified fireman if you can lift 400 pounds? Not necessarily. Once you've crossed the 200 pound threshold, there are probably other skills that are more important than lifting weight. So it is with the GMAT. At some percentile (well below the 80th percentile) your Quant skills are proven and so your total GMAT score, combined GMAT score percentile, and the rest of your application become more important. This advice really depends on who you are (as seen in the examples above). If you have a proven math background, a 700+ score, but a super low quant percentile, you might be totally fine. If you have a desirable background/story that a particular school is looking for, again, a lower Quant score could be A-OK. Most people with a Quant score below a 45 gunning for the top two or three MBA programs. Most people who are in a competitive bracket with a Quant score below a 45. Any applicant applying to top ten-ish schools with a quant score below a 40. Have you had a different experience with your admissions process? Follow up with any questions or comments! What is the GMAT out of? The GMAT is out of 800. With 200 being the lowest possible GMAT composite score. The GMAT quant scaled score is out of 51. The verbal scaled score is also out of 51. 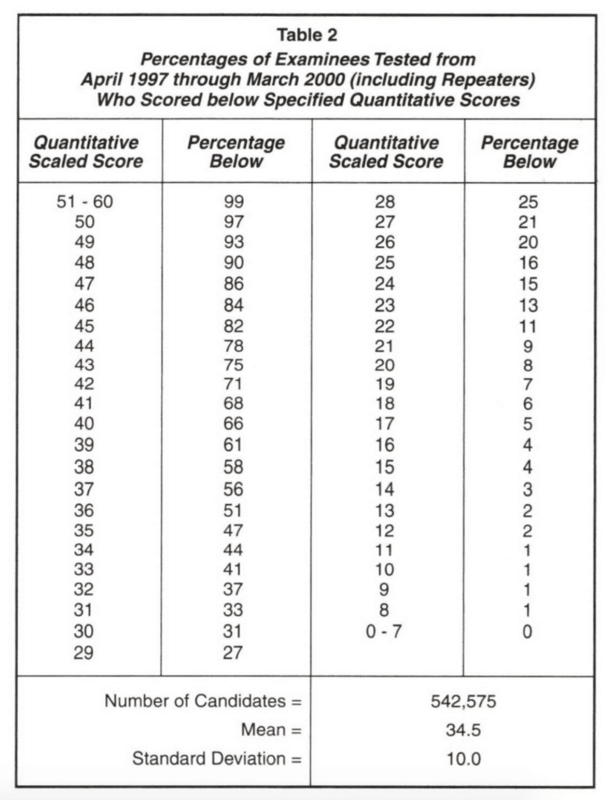 Technically both Quant and Verbal scores are out of 60 but only scores up to 51 are possible. The integrated reason is scored from 0 to 8. The essay is scored from 1-5. The GMAT score range is from 200-800 for the composite score and from 0-51 for the Quant and Verbal subsection scores. The composite score (out of 800) is the one the counts most for MBA admission followed by your quant sub section score. What is the GMAT average score? What are the average GMAT scores by school? What are the GMAT percentiles for 2018? 750 98% Back in the day a 750 was in the 99th percentile. That aside, GMAT composite score percentiles have stayed mostly stable. 51 96% The top quant percentile has dropped again. A full 4% of people are getting perfect GMAT quant scores. 45 55% This used to be the 80th Percentile in the year 2000 and is what the 80/80 admissions rule seems to be based on. In 2000, a 750 was in the 99th percentile!